Ben Gurion Airport (Hebrew: נמל התעופה בן-גוריון‎; Arabic: مطار بن غوريون الدولي‎) (IATA: TLV, ICAO: LLBG), commonly known by its Hebrew acronym as Natbag (נתב״ג), is the main international airport of Israel and the busiest airport in the country, located on the northern outskirts of the city of Lod, which is about 45 km (28 mi) northwest of Jerusalem and 20 km (12 mi) to the southeast of Tel Aviv. Named in 1973 after Israel's first Prime Minister David Ben-Gurion, the airport serves as a hub for El Al, Israir Airlines, Arkia, and Sun D'Or. It is operated by the Israel Airports Authority, a government-owned corporation that manages all public airports and border crossings in Israel. Lod Airport, 1958. The building is currently the Terminal 1 building. The airport began as an airstrip of four concrete runways on the outskirts of the town of Lydda (now Lod). It was built in 1936, during the British Mandate for Palestine, chiefly for military purposes. First known as "Wilhelma Airport", it was renamed "RAF Station Lydda" in 1943. During World War II it served as a major airfield for military air transport and aircraft ferry operations between military bases in Europe, Africa, the Middle East (mainly Iraq and Persia) and South/Southeast Asia. The first civilian transatlantic route, New York City to Lydda Airport, was inaugurated by TWA in 1946. The British gave up the airport at the end of April 1948. Soldiers of the Israel Defense Forces captured the airport on 10 July 1948, in Operation Danny, transferring control to the newly declared State of Israel. 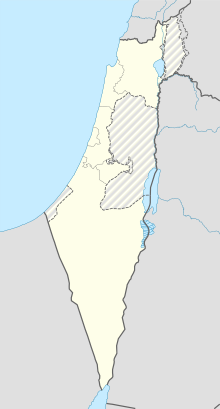 In 1948 the Israelis changed the official name of the nearby town from Lydda to Lod, the airport's name becoming Lod Airport. Flights resumed on 24 November 1948. That year, 40,000 passengers passed through the terminal. By 1952, the number had risen to 100,000 a month. Within a decade, air traffic increased to the point where local flights had to be redirected to Tel Aviv's other airport, the Sde Dov airfield (SDV) on the city's northern coast. By the mid-1960s, 14 international airlines were landing at the airport. The airport's name was changed from Lod to Ben Gurion International Airport in 1973 to honour Israel's first Prime Minister, David Ben-Gurion, who died that year. While Ben Gurion Airport has been a target of Palestinian attacks, the adoption of strict security precautions has ensured that no aircraft departing from Ben Gurion airport has ever been hijacked. On the other hand, airliners hijacked from other countries have landed at Ben Gurion, contributing to two major incidents in the airport's history. In the first, on 8 May 1972, four Palestinian Black September terrorists hijacked a Sabena flight en route from Vienna and forced it to land at Ben Gurion airport. Sayeret Matkal commandos led by Ehud Barak stormed the plane, killing two of the hijackers and capturing the other two. One passenger was killed. Later that month, on 30 May 1972, in an attack known as the Lod Airport massacre, 24 people were killed and 80 injured when three members of the Japanese Red Army sprayed machine gun fire into the passenger arrival area. The victims included Aharon Katzir, a prominent protein biophysicist and brother of Israel's 4th president. Those injured included Efraim Katzir and a group of twenty Puerto Rican tourists who had just arrived in Israel. The only terrorist who survived was Kozo Okamoto, who received a life sentence but was set free in a prisoner exchange with the PFLP-GC. More buildings and runways were added over the years, but with the onset of mass immigration from Ethiopia and the former Soviet Union in the 1980s and 90s, as well as the global increase of international business travel, the existing facilities became painfully inadequate, prompting the design of a new state-of-the-art terminal that could also accommodate the expected tourism influx for the 2000 millennium celebrations. The decision to go ahead with the project was reached in January 1994, but the new terminal, known as Terminal 3, only opened its doors a decade later, on 2 November 2004. During a conflict with Gaza in July 2014, several airlines banned their flights to the airport for a couple of days. Ramon Airport, an international airport under construction in the Timna Valley in southern Israel, will serve as a diversion airport for Ben Gurion when it opens in 2019. The longest flight from the airport was across Europe, the Arctic Ocean, Alaska, and to Honolulu, Hawaii on January 2, 2017 by the private Airbus A340-500 of billionaire casino mogul, Sheldon Adelson. Free wireless internet is provided throughout the terminal. The terminal has three business lounges—the exclusive El Al King David Lounge for frequent flyers and two Dan lounges for either privileged or paying flyers. In December 2017, the IAA announced a long-term expansion plan for Ben Gurion Airport estimated to cost approximately NIS 9 billion. Plans include further expansion of Terminal 1, a new dedicated domestic flights terminal, a major expansion of Terminal 3’s landside terminal which would add approximately 90 additional check-in counters, construction of Concourse A, and additional aircraft parking spaces and ramps. In addition, air cargo facilities would be relocated to a large, currently-unused tract of land in the northern part of the airport’s property (north of runway 08/26) where additional aircraft maintenance facilities would also be built. In the meantime, to ease immediate overcrowding problems at Terminal 3’s landside terminal, in the Spring of 2018 a temporary large, air-conditioned tent was erected adjacent to Terminal 3 housing 25 check-in counters and security screening facilities. Israel has an integrated nationwide public transport payment system covering multiple transit options (train, bus and light rail) run by various operators using a single payment card: the Rav-Kav. It features flexible tariff arrangements and offers free transfers between transit methods within certain geographical zones and time periods. A public transport information office which also issues Rav-Kav cards is located in the arrivals hall of Terminal 3. With a few exceptions, most public transport options (except for taxis and service cabs) do not operate on the Sabbath (i.e., from early Friday evenings to late Saturday evenings as well as certain Jewish holidays). Located on Highway 1, the Jerusalem – Tel Aviv highway, the airport has a total of 11,300 parking spaces for short and long-term parking. The spaces for long-term parking are situated several kilometres from the terminal, and are reached by a free shuttle bus. Car rental at the airport is available from Avis, Budget, Eldan, Thrifty, Hertz and Shlomo Sixt. ^ a b "Official airport statistics for Ben Gurion Airport". IAA. Retrieved 10 January 2019. ^ a b "AD 2.5 TEL-AVIV / BEN-GURION – LLBG". Retrieved 18 July 2014. ^ Dempsey, John S. (23 March 2010). Introduction to Private Security. Cengage Learning. ISBN 0495809853. ^ "End of an Era – The Historic Terminal 1 has Re-opened, Serving Passengers on Domestic Flights". Israel Airports Authority. 20 February 2007. Retrieved 28 April 2007. ^ "Tel Aviv – Ben Gurion Airport (TLV) Information". Essential Travel. Archived from the original on 21 April 2007. Retrieved 29 April 2007. ^ Blumenthal, Itay (15 February 2018). "נתב"ג מתרחב: נחנכה הזרוע הרביעית" [Ben Gurion Airport Expands: Fourth Concourse Inaugurated]. Ynet. Retrieved 17 February 2018. ^ "Ben Gurion Airoport – The 60's (IE browser required)". Israel Airports Authority. Retrieved 12 June 2008. ^ Blumenkrantz, Zohar (7 August 2007). "Color tags discontinued". Haaretz.com. Retrieved 18 July 2014. ^ "Tirana International Airport: New flight Tirana–Dortmund begins, operated by Wizz Air - Tirana International Airport". www.tirana-airport.com. ^ a b "Arkia to launch 2 Israel - India routes". Globes. Retrieved 12 February 2019. ^ "El Al adds Chicago service from late March 2020". AirlineRoute. 24 March 2019. Retrieved 24 March 2019. ^ "El Al returns Chicago service". Ynet. 20 March 2019. Retrieved 27 March 2019. ^ "אל על תחל לטוס לניס שבריביירה הצרפתית באביב - IAS". 25 October 2018. ^ "Hola ברזיל: חברת התעופה LATAM תפעיל קו ישיר לישראל - Passportnews". 4 April 2018. ^ "LOT Polish Airlines plans Krakow – Tel Aviv launch from Feb 2019". Routesonline. Retrieved 13 July 2018. ^ "Neos adds Zadar – Tel Aviv service in S18". Routesonline. Retrieved 22 April 2018. ^ "Ryanair announces winter timetable 2019 with 15 new routes from Budapest Hungary". Travelfree. 27 March 2019. Retrieved 29 March 2019. ^ 2018, UBM (UK) Ltd. "El Al / Sun d'Or schedules new seasonal routes in S19". ^ Liu, Jim (28 March 2019). "Turkish Airlines adds Izmir – Tel Aviv service from late-May 2019". Routesonline. Retrieved 28 March 2019. ^ Liu, Jim (19 March 2019). "Yanair S19 Kiev – Tel Aviv service adjustment". RoutesOnline. Retrieved 19 March 2019. ^ Flightradar24. "Flightradar24.com - Live flight tracker!". Flightradar24. ^ "Shuttle from Ben Gurion Airport to Tel Aviv". withflo.com. Retrieved 14 August 2016. ^ "Car Rental in Ben Gurion Airport-up to 15% discount-Shlomo Sixt". en.shlomo.co.il. Retrieved 14 December 2015.